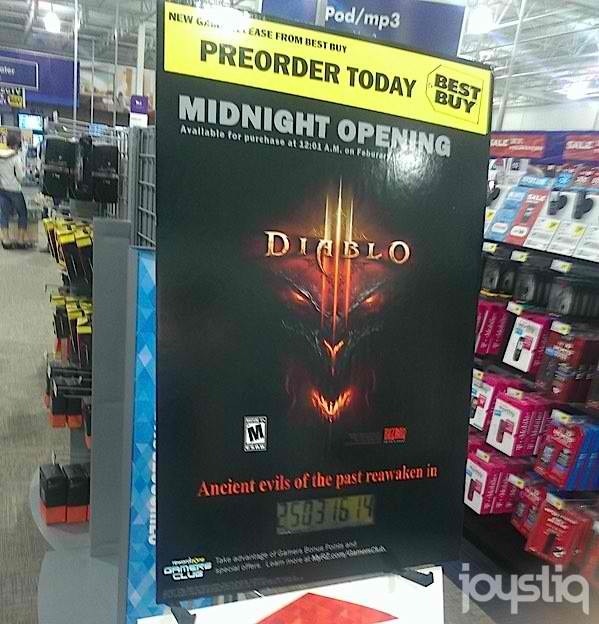 According to Kotaku, an elaborate display that popped up at a Best Buy in Rochester, Minnesota, shows that Blizzard’s eagerly-anticipated third entry in the Diablo series is hitting stores in February 1st. Kotaku writes: “Joystiq snagged a photo of the display in question after a Canadian Twitter user noticed it while on a shopping trip to Minnesota. The display advertises a midnight launch for Diablo III on February 1, along with a digital countdown timer. That’s not the sort of ad you put up on a lark. That takes the guys from electronics helping out, maybe even some really expensive cables. Yep, the sign is legit as per Joystiq but I’ll wait for the official announcement from Blizzard, Thank you.